October 14, 15, 16 & 17, 1987. KH wrote: “Harriet a divorcée, living in an elegant flat in Brighton, solves her financial problems by entertaining two married gentlemen callers on different days of the week. The scheme faces collapse when her friend Anne, whose marriage is tottering, arrives at the flat, hotly pursued by her husband. One of Harriet’s lovers is confined to Harriet’s bed with a sprained ankle and the second lover turns up unexpectedly closely followed by two irate wives in search of itinerant husbands. WICK Theatre Company have lined up an experienced cast to do full justice to their production of the lively farce, Key for Two. Opening at the Barn Theatre, Southwick, on Wednesday, the script involves the promiscuous antic of a bored wife and revolves around seven key characters. Written by John Chapman and Dave Freeman, the play is directed by experienced Wick actress, Karen Mulholland. Leading man is Neil Shephard who has revived his association with Wick after some years. He will be joined on stage by an experienced cast, including Ralph Dawes, Margaret Faggetter and Pat Moss. The show, which runs until October 17, includes a Saturday matinée. A WICKEDLY comic script and the finely-honed acting skills of Wick Theatre Company provided side-splitting entertainment at the Barn Theatre last Wednesday. 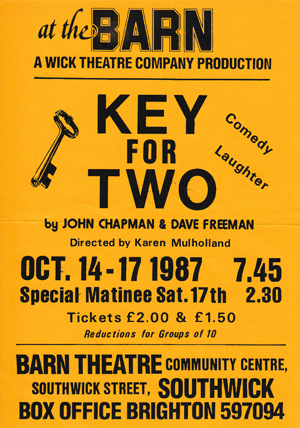 Director Karen Mulholland picked a definite winner with Key for Two, which introduced many of the audience to the caustic and brilliant wit of playwrights John Chapman and Dave Freeman. The excellent timing of the cast, plus some classic one-liners, made the show’s opening night an unqualified success, giving a satirical insight into the pitfalls of marital infidelity, It would be unfair to single anyone out for special praise, but Ralph Dawes excelled as the North countryman Alec. He delivered his punchy, droll lines with remarkable aplomb, doing full justice to his rôle as cheating husband – and cuckolded lover. Leading lady Pat Moss coped admirably with the demanding part as the mercenary Harriet, which involved her being on stage for most of the action. She was well backed by Margaret Faggetter as the man-eating Anne, who added some spice to the proceedings by stripping down to her underwear! An excellent character portrayal came from Harry Atkinson, who starred as the intoxicated Richard – slurring his voice and staggering about like an habitual drunk. Meanwhile, Joan Bearman turned in a strong performance as the snobby, middle-class housewife Magda, alongside Rosemary Biggs as northern battleaxe Mildred. Not to be forgotten was Neil Shephard, as the second wayward husband, Gordon, who did full justice to his likeable, but rather pompous, part. One of the hallmarks of this production was the excellent scenery, which created an elegant flat for the two-timing Harriet. The cast were also extremely well-rehearsed, delivering their lines bang on cue – seldom needing a prompter.